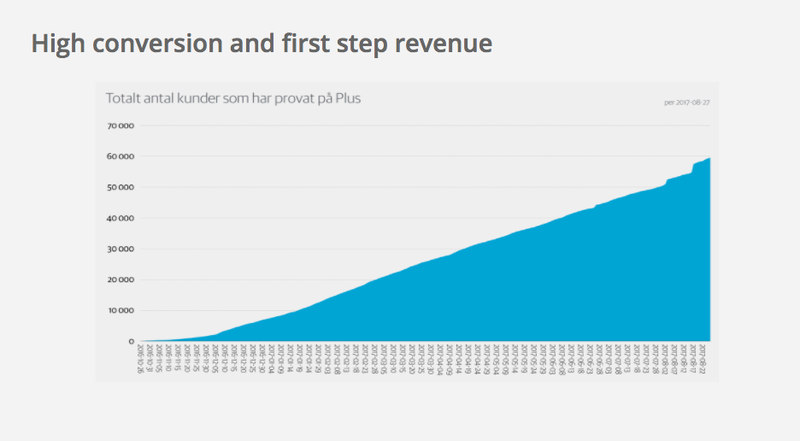 Swedish legacy publisher Mittmedia has stepped into the business area of editorial paid content to secure future survival. Data shows that sustainable monetization is dependent on ability to drive retention toward paying customers to assure the longevity of the subscription model. To accomplish this, Mittmedia is building Soldr Personalization Service with the mission statement: ”Distributing the right content to the right end user at the right time in the right context/channel”. SPS will apply machine learning on the data of the Mittmedia digital ecosystem to deliver highly personalized content lists (on a cluster-individualized level) to the Mittmedia news products. The aim is to create truly personalized products (while avoiding filter bubbles), driving engagement and loyalty among customers, creating sustainable monetization. The measured effect can be described as the consumption of content over the total volume of exposed content/average user. Soldr Personalization Service will, if further financed and successful, add a lean approach to the production chain of editorial content. 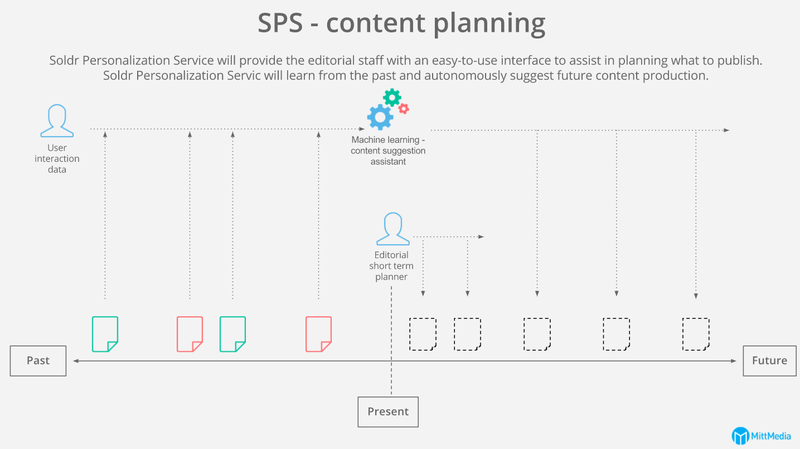 An interface part of SPS will be integrated in editorial toolbox Aracua, helping editorial staff toward a lean production approach in planning and production of paid content. Agile and fail-fast innovation in media business is synonymous to survival. In order to stay alive, media outlets must innovate and iterate business models, products and processes. This is especially true for local legacy media companies of which swedish Mittmedia is a good example. During the past ten years, Mittmedia has come to the same conclusion as almost every other local legacy media company in the world. 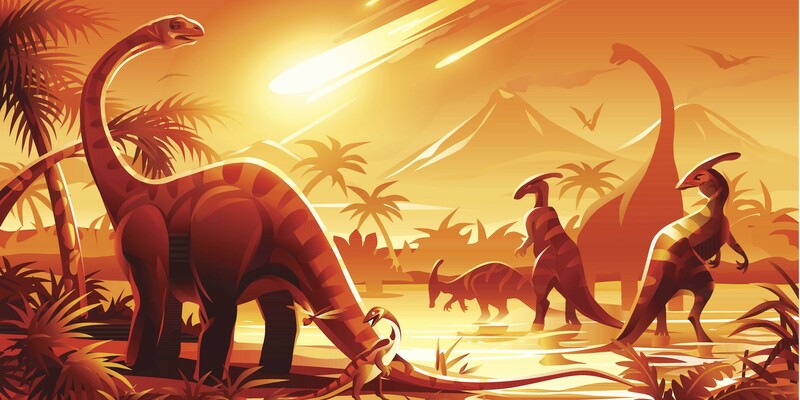 The printbased business models are extinct, dinosaur-style. Mittmedia has for the past years made a significant transition toward a digital first approach regarding business, organisation and process, both when it comes to editorial output and ad- business, locally and regionally. In the first phase Mittmedia stepped into the traditional digital business models, seeing good effect. But after having seen that the opportunities in these models were much smaller than expected due to the dominance of the big platforms, Mittmedia came to the conclusion that the traditional digital models will not carry the company into the future. Thus, what we might call a ”second digital transformation” was necessary to survive. As a consequence, Mittmedia has taken firm steps to renew its two main digital business areas. Innovating and transforming the digital editorial leg into the paid content business model and make it the main area of editorial monetization and revenue. Innovating and transforming the digital advertising B2B leg into audience targeting, 360-channel offerings, programmatic header bidding, other ad tech solutions and much more. To support this next digital transition, Mittmedia has built its digital ecosystem with relevant components (news products, data platform Soldr, content creation toolbox Aracua, and ad data platform and sales tool Reacher including underlying adtech) to make it possible to innovate agile and fast to renew business based on data and tech. In the advertising business area, Mittmedia is on a good way of successfully renewing business, process and revenue by creating audience targeted advertising, new relevant and effective digital 360-offerings to customers, moving its sales force into a digital first work process and infusing appropriate ad tech to enhance effect/relevance and push up price levels. In regards to the paid content business, Mittmedia has made a good start, launching its paid content offering/solution over in its products the past year. The results are better than expected in regards to number of converted customers and first step revenue. While nice to begin with, the initial success must be followed by hard work . The strategy for converting free-riders into paying customers will continue along established methods and will also be iterated. Unfortunately, conversion alone won´t be enough to create a sustainable paid content business. Our data/research clearly shows that the survival and further monetization in the paid content area is totally dependent on our ability not only to convert free riders into paying customers but also to build a lasting and loyal relationship to already converted customers, i.e. work hard on retention/anti churn. In fact, calculations show that an all too successful conversion strategy without retention/anti churn efforts will be actively destructive for our ability to retain customer loyalty and monetize in the long run. fConversion without retention will drive customers into the group of churned users and we will actively cripple our ability to monetize. If we forget to work anti churn, the more we convert, the more we´ll drive users into the group of churned customers. The churn effect will eat chunks out of existing customer base and of possible market share. When having come to this conclusion it´s not hard to understand that it´ll be essential for sustainable monetization that we focus on retention/anti churn alongside continued conversion. This will have to be done right after conversion, since churn process starts immediately after conversion point. The process on working with retention/anti churn will be addressed in a number of established methods supported by tech and data (KPI mapping, customer journeys, funnel analysis, customer re-allocation between devices/products, user experience focus in news products, and other loyalty driving actions). But we´re quite sure that one our main concerns in working with retention/anti churn should be toward the optimization of the production chain of the editorial content that is the core part of our product offering. The chain of producing and distributing editorial content must be adapted to new user behaviours and preferences to drive loyalty/retention by meeting user/market demand on an individual level. First, let´s have a look at the current value chain of production and distribution of digital content. Simplified, MittMedias way of presenting articles to its readers is currently based on journalists ”gut experience” of reader peak times towards which article publishing deadlines are steered. Furthermore, the current content production process is rooted in the quite outdated assumption that users as a collective (not on an individual basis) are exposed to the same content and that the overall output mix (disposition) of content therefore should reflect the average user’s interests. For example, if the average total consumption of entertainment news is 20%, the content production should produce a mix of content consisting of one fifth of entertainment content. Historically, given the market position many news companies (with a print legacy) are coming from, the production chain described above has been working just fine. In many cases the local municipality population have gathered around one or few century old news services, leaving the task of setting the agenda up to the editorial teams in a monopolistic setting. In market terms this is one of the few situations where producers of goods have been able to focus on supply rather than demand. This worked well in times of stationary PC:s and cable phones, when readers actively had to search themselves to the news and not the other way around. But in an individual-based consumption reality where users can be seen as ” all available”, that way of looking at production and distribution wont be enough to catch readers attention enough to build a sustainable monetization by maximizing conversion and retention in the paid content business area. 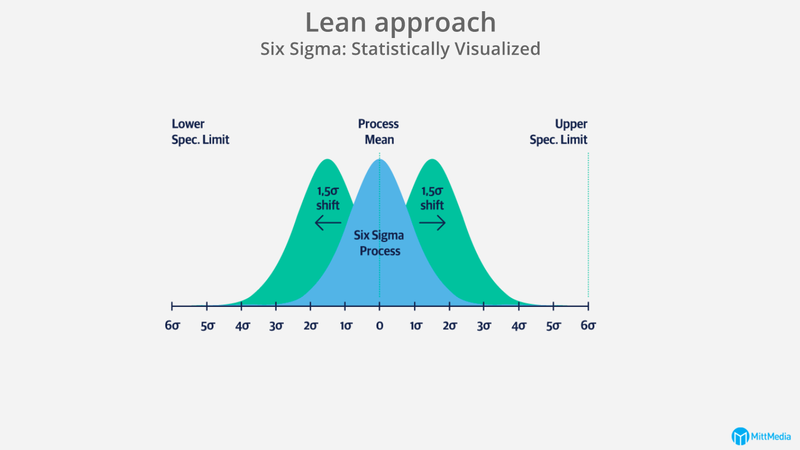 Therefore, we need to iterate and adapt to serve users with content by way of another type of production chain, more focused on the concept of lean production in all phases. All-time available users pose a challenge to this way of exposing articles, but also an opportunity for business. The challenge is to capture and retain the user’s’ interest the moment the user chooses MittMedias’ products, while the opportunity is to use available data to understand users in terms of their availability, interests, locations, et c. and being able to monetize on this data. So, how do we collect and interpret that data? 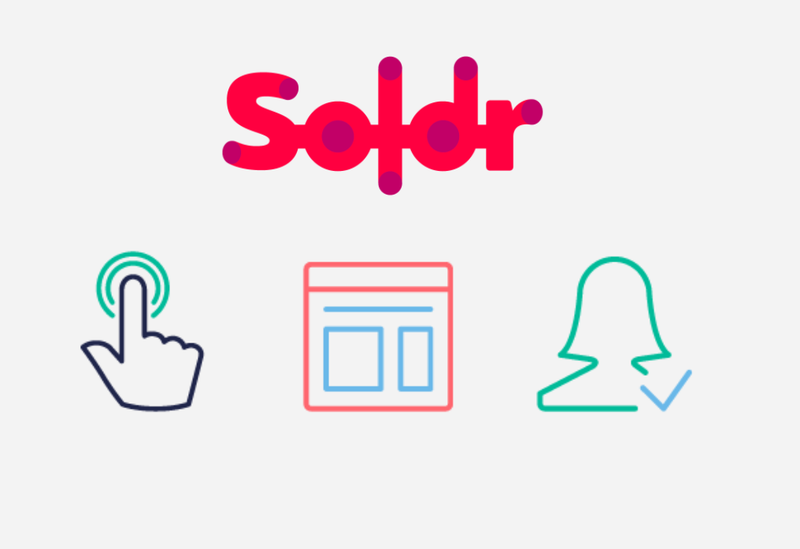 At the heart of the Mittmedia digital ecosystem is the data platform Soldr. In simple words, Soldr collects, compiles and combines three different types of data (user data, event data and content data), crucial for understanding the users in all of the above aspects. Soldrs ability to combine these types of data opens up to the mentioned opportunity to understand users in terms of their availability, interests, locations, etc. With this data/user understanding, we have the foundation to build services and create products with the kind of content personalization needed to drive conversion, retention and monetization of paid content. 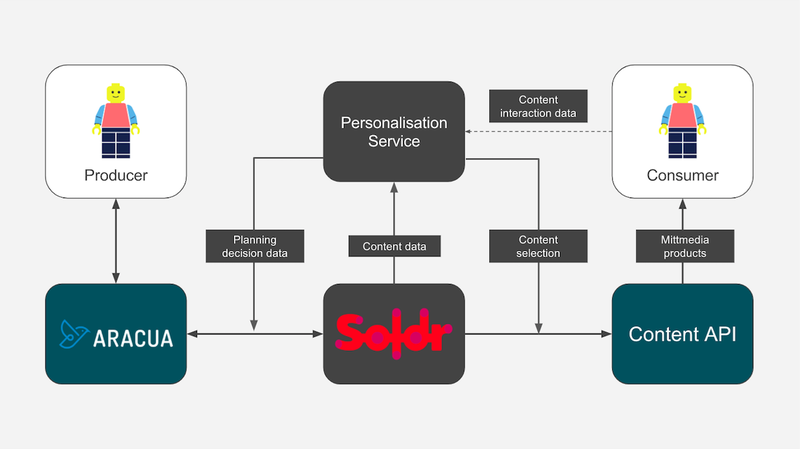 Enter Soldr Personalization Service, part of the Soldr data platform. 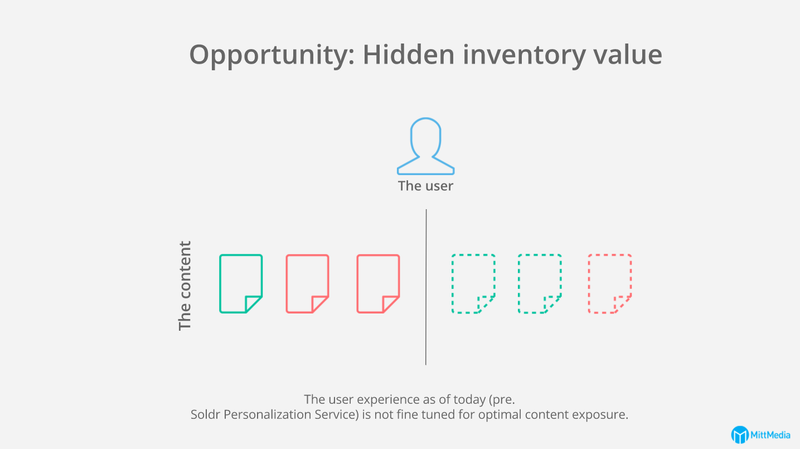 The Soldr Personalization Service mission statement could be described as: ”Distributing the right content to the right end user at the right time in the right context/channel”. The project has the goal to capture the users’ interest by serving the Mittmedia products with personalized lists letting the products present more user relevant articles to increase the average users consumption of content within a set value of exposed content links or “teasers”. The underlying assumption is that a user being exposed to a personalized list of article recommendations compiled by Soldr Personalization Service will read more articles than a user being exposed to a list with articles selected through a generalized selection of trending articles based on the average user’s short term consumption, commonly defined as “trending” or “most read”. The user will then be more inclined to convert to a paying customer. The same approach is also true for already converted users, where a more relevant content mix would lower churn rates from the active user group. There are strong indicators that the bulk churn rate of paying users is directly linked to the user not finding enough relevant content to stay loyal. The same thing is also true for conversion rates, where a returning user who continues to hit a locked paywall has a high probability to convert to a paying account. Given that the news sites/apps of today are heavily based on the time of publishing and the content prioritization within the editorial teams we can see clear trends in data showing that an average user interested in (for example) local culture often misses the time frame for which the majority of the relevant content is clearly exposed on the front page. In short, the production and distribution of paid content doesn´t make up for a supply that meets the market demand at a specific time. This is a strong indicator that the total actual value of the content inventory seen from a conversion/retention perspective is much higher than what its current efficiency is indicating. In short, we have a lot of content value to unlock and monetize on. the production and distribution of paid content doesn´t make up for a supply that meets the market demand at a specific time. Exposing the right content to the right user at the right time in the right channel will ensure that Mittmedia will be able to optimize conversion and retention of customers monetize and make better on the actual value of the content and to see this in the accumulated income driven by the paid content business model. So, what about so called filter bubbles, an important issue coming up for debate for the the past years? Well, we´re pretty confident that Soldr Personalization Service will avoid that problem. Soldr Personalization Service is not delivering a programmatic article list to our news products and customers. The selection of the content list is more ”organic”, based both on the user’s specific cluster and on overall consumption. We also use a hybrid approach between content-based filtering and collaborative filtering, plus making sure recent articles are being taken in. Filter bubbles are often a problem for approaches that use content-based filtering only. It is often also called the “Cold-start problem”. For example, if there is trending content not directly related to the users interests it will still show up in the list. The project is now in research/design phase and started by defining the project vision and effect goals towards which all later research steps are directed. During the research phase, clustering approaches are used in order to find user segments based on reader interest, while adhering to definitions of a “good cluster”. The personalized article list could be proposed to those user segments based on factors that seem important. Three of those factors have been identified: 1) Inter-cluster interest — users in the same cluster are assumed to have approximately the same interest distribution and therefore one user could be interested in articles that other users in the same cluster consume 2) Recency — the “younger” the article, the more interesting it is to readers 3) Extra-cluster interest — articles that are read in a large volume by a general public are probably also interesting for cluster users. Such articles could for example contain topics that have a great impact on the local region. Once research is believed to result in an adequate article list personalized to each cluster, hypothesis are established and a live test can be started. A controlled user group will then be presented with the suggested articles and consumption versus exposure is measured. The test will then be evaluated to compare the impact of the implementation to the status quo, thus validating or rejecting the hypothesis. By iterating research and tests, the end results can be improved and tweaked into the final product. The outcome should be a personalized article list that is adapted to each clusters’ consumption patterns and open to feedback, i.e. “learning”, while avoiding filter bubbles. At the base of the system there will several machine learning models working together. Effective users consumption in comparison to the proposed articles could be used in some kind of feedback-loop to adjust the article lists or clusters even better. The machine learning approach should not result in a closed loop, but should be able to adapt to changes in user habits and preferences. New users can be placed into existing clusters with the help of a classification algorithm. Furthermore, there should be an opportunity to adapt the method and outcomes to more refined goals such as conversion of paying users. In addition, the personalization could be refined even more f.ex. 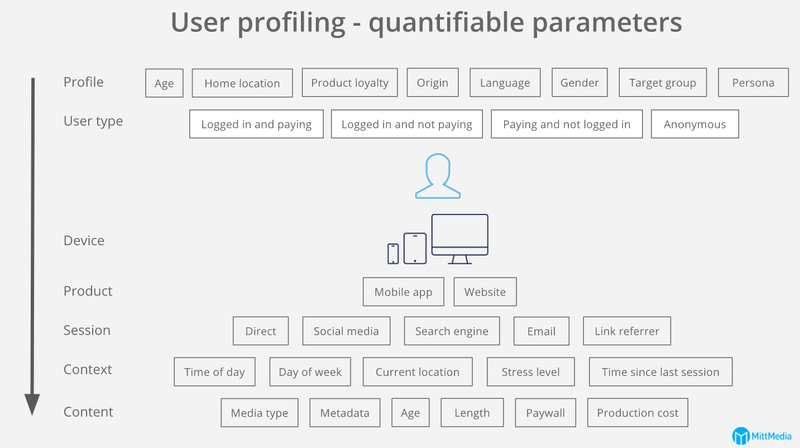 by clustering on user-article location, UX personas, or a combination of different factors (although first tested in isolation in live-tests). Finally, a satisfying personalization service needs to scale correctly for all users, clusters and products. If the aim is to have overall effect on monetization, scaling over the complete Mittmedia product line is necessary. From a technical point of view, scaling of verified live tests is quite trivial, since all of the news products are a part of the Mittmedia digital ecosystem. So, how do we actually prove that the scaling of personalized articles lists in the Mittmedia products is actually successful? How do we know if we´re on our way to unlock the hidden value of our editorial content and drive retention and monetization? To understand if we are on the right track to business effect, we need to establish a proven and chain that starts of with math, goes through metrics and effect goals up to the general business KPI:s that we need to improve. One way to describe this is using a Markov Chain to estimate how the different user groups will develop over time. In short,a user of Mittmedia’s products is always in one of three states. The transition between being a susceptible paying customer to becoming a paying customer is labeled as a ”conversion”. The transition between being a paying customer and a former paying customer is a churn process. 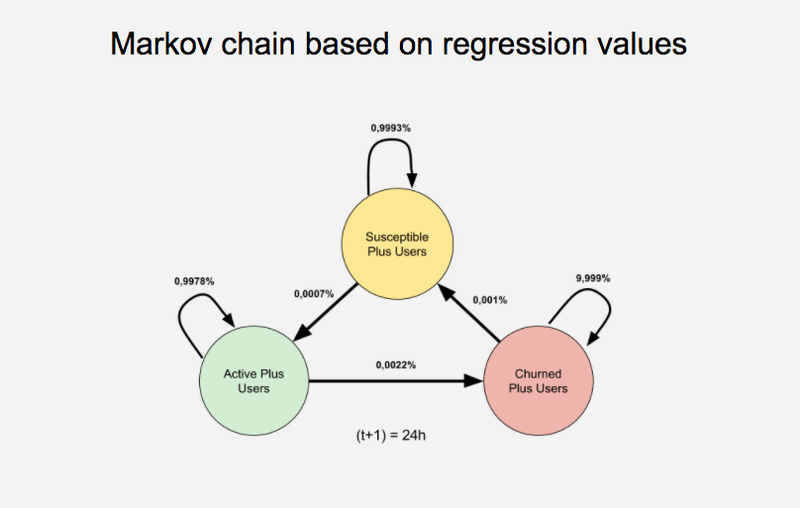 The factors that are affecting users in the churn group to once again become susceptible to start paying for news content are hard to identify, but given that >95% of all converted users are new users it is obvious that the most sustainable method to keep increasing the income level is to take action on keeping a high retention level of paying customers. As of today, Mittmedia is able to convert 0.0007% of the entire group of susceptible paying customers to paying customers over 24 hours. Of the paying customer group, 0.0022% churns during the same time period. The Soldr Personalization Service will aim to affect those numbers, and the goal is to primarily lower the churn rate, but also to increase the conversion rate. It is assumed that both churn rate and conversion rate can be steered towards the desired direction by presenting more relevant articles to users. To know if such an implementations can lead to reaching the project goal, general effect metrics have been defined to which implementation results should be compared (se below section on metrics and effect goals). For a before-after comparison is essential that the status quo, and results after an implementation are measured with exactly the same effect metrics and parameters in a controlled environment. The comparison should show if changes have occurred, and the magnitude of such changes. The first research steps, an analysis of user and article related data, indicate that “article content” and “timing” can be two factors that affect user behaviour. Therefore, two KPI:s have been chosen that are connected to those two factors and future implementation should consequently be concerned with article content and timing. Consumed/exposed articles (= efficiency). Given that exposed articles are held constant, this measure is expected to increase with a successful implementation. Time difference between published articles and the maximum velocity of consumed articles. This measure is expected to decrease with a successful implementation since the article list is shown to users when the users are online. These two KPI:s are identified by Mittmedia as clear indicators on how relevant the user finds the news services provided, and more active users who consumes more content are expected to give lower churn levels (as in, the users are experiencing that they are getting more out of their subscriptions). The overall company business KPI:s that we need to improve when scaling are conversion and retention of paying customers/decrease of churned customers. As already stated, the Soldr Personalization Service project won´t be able to do anything for business without the news products that are our windows to the customers and the arenas in which we do our business. 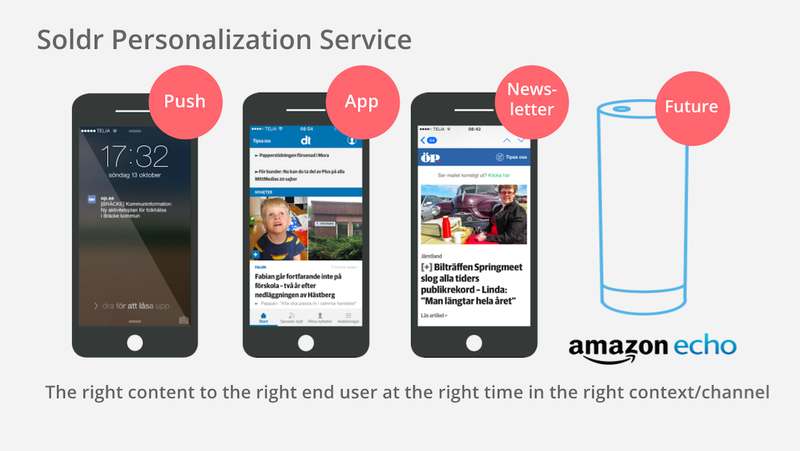 It´s quite clear that Soldr Personalization Service will affect the current Mittmedia news products. It´s also true that if the current products won´t do the job, Soldr Personalization Service must drive the need for new products, better equipped to enhance monetization. The historical/main approach towards digital news products is often based on an iteration of traditional news publishing for printed newspaper. The mix, composition and distribution of content on a standard news site/app is generally based on the interests and the profile of the average user. Building a more personalized and relevant news application challenges this approach, since a monetization project like the current focus on paid content within Mittmedia needs to provide the same type of personalized service as the user is accustomed to in other part-of-the-every-day-life digital subscription products such as streaming services for video and music. The biggest challenge with creating a personalized and relevant news product for the end user is adapting the distribution of content to user experience well adapted to the user’s needs and context. To manage the above we are going to apply a lean production approach to the content inventory, making sure that the entire digital Mittmedia ecosystem is learning and constantly adapting from user behaviours and meet market demand on a granular level. The deliverable end user products (such as sites and apps) will undergo redesigns and feature development to accustom the different platforms towards a more personalized (relevant) content mix. One expectation (based on previous user testing) is that the current type of news product will gradually transition over to a more feed like (“flowy”) type of content presentation. When the product is able to learn from the user there might also be a greater need for the user to provide manual settings not usually prompted for within an news application. For example, since Mittmedia is heavily focused on local news, the user being able to provide geographical data is a key factor in deciding the relevance of the provided content. So, what about the editorial staff? The indispensable journalists going to work each day to create and serve users/customers with local news and content, thereby upholding the democratic mission of Mittmedia? If we accept the fact that business innovation is necessary to survive, we must also let the consequences of it have impact on how we work with editorial content on a daily basis. While Mittmedia has been very good at letting innovative effects impact the editorial process for the past year, we´re convinced that the implementation of Soldr Personalization Service in all it´s parts could have further and sometimes profound effect on editorial processes. It´s our belief that the necessary optimization of production of paid content should be accomplished by humans and machines in collaboration, with the right allocation of type of resources to the right phases of production. We acknowledge that humans are essential in the production phase of unique editorial content and will be so for the foreseeable future. But in regard to optimizing the selection of content the end user/market is demanding and the timing of distribution, machines will be able to help journalists or do the job in a more value enhancing way. As already stated, the Mittmedia editorial staff now work against deadlines for publishing based on tradition and gut feeling of what is to be produced and when it´s supposed to be distributed. This gut feeling is, as we´ve already concluded, combined with the assumption that users consume editorial content as a collective (not on an cluster/individual basis), that users should be exposed to the same content, therefore that the overall output mix (disposition) of content should reflect the average user’s interests. 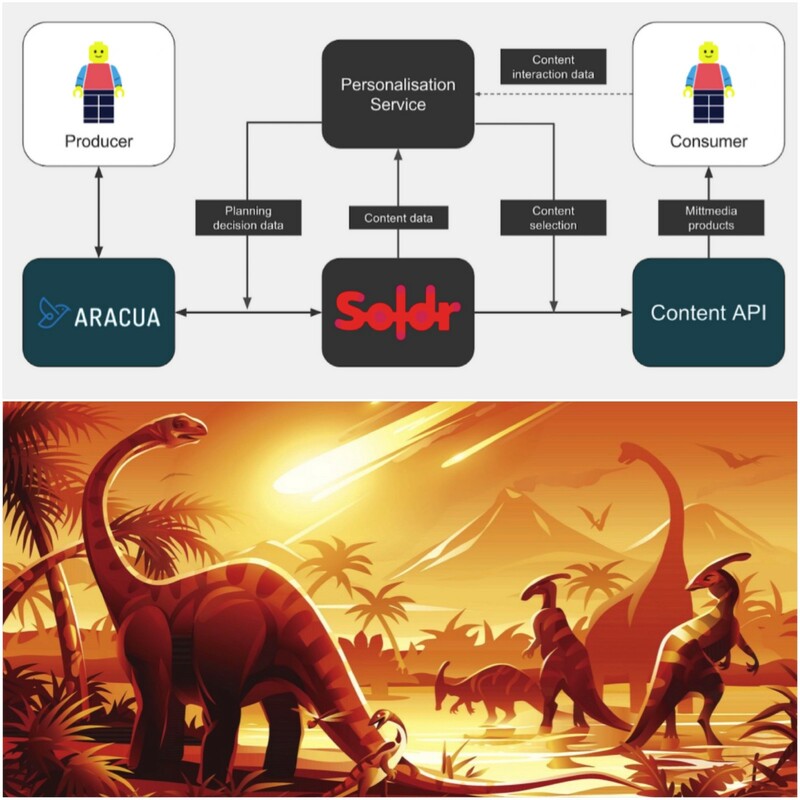 We´ve also gone through the Soldr Personalization Service mission statement in regard to a personalized content distribution on a user/clusterbased level. If we succeed, the distribution abilities of Soldr Personalization Service will have an impact on editorial staff, who will in the future probably never publish a piece of content, but only make it ready-to-go, handing over the optimizing of publishing/distribution (on a cluster-individual level) to Soldr Personalization Service. That will enable journalists/content creators to be able to focus on the phases of production of which no machine can do the job, which is the planning and production of unique editorial content. In theses production phases, the Soldr Personalization Service will be able to help editorial staff by estimating and giving proactive system feedback on appropriate selection and optimal characteristics of created content. This part of the Soldr Personalization Service project is aimed at creating tools for journalists to plan their work in a better way and to produce content. Such tools for planning and production will be an important part of the editorial toolbox Aracua. The role of the machine in the Aracua interface will be to represent the end user (preferences and demands) towards the editorial staff. The machine feedback can be built and implemented in the Aracua interface in a number of ways, as of which we´re currently experimenting. Production phases assisted by Soldr Personalization Service. Blue fields represent Aracua user work processes. Grey fields are machine learning assisted decisions. Black field is Aracua user independent automated distribution. The result will be an editorial lean production cycle with continuous and finetuned production and distribution of content supply according to datadriven understanding of market demand. With a correctly applied lean production approach, editorial resources will be better allocated, while at the same time respecting the journalistic process and enabling editorial staff to fulfill their democratic mission. Even though the Soldr Personalization Service project is currently driven by and initially focused on accelerating monetization in the Mittmedia paid content business, it is also developed to fit and enhance other business models by way of personalization and machine learning. Such models could be the traditional digital business model or the true native business model (in fact, from a data and platform perspective true native content and editorial paid content are exactly the same , but that´s another blog post entirely). As long as the different business models and the products that serves them are collecting the relevant data and set upp their unique business effect goals and metrics, the way we go about the process will follow the same principles. The project has undergone the first phases of design/research and will during the winter, if things go as planned and we get further financing, be ready to implement the first live tests in selected Mittmedia news products, based on data and machine learning. Things are looking solid so far and we´re looking forward to the assumptions being verified or falsified. We have a long way to go. As of the Aracua part, all 500 journalists of Mittmedia is now stepping into the editorial toolbox for their daily work. 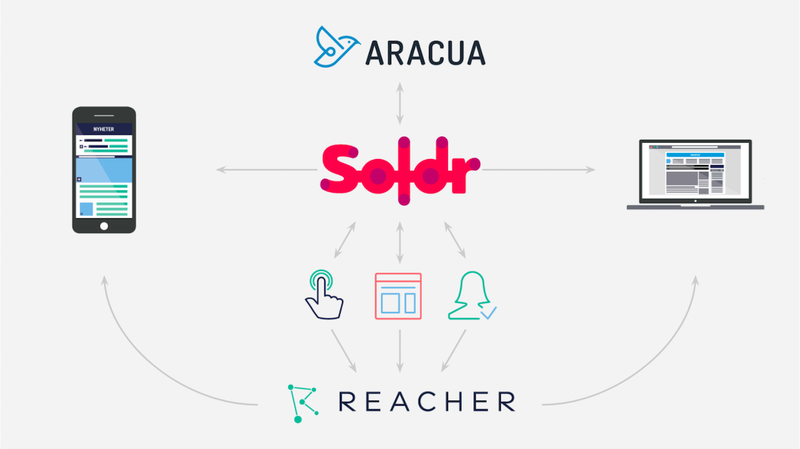 Later this winter, if the project continues, we´ll start to test Soldr Personalization Service components in the Aracua interface to help editorial staff plan and execute production and distribution of our local content in a way that is even more fitting to customer/market demand. If we succeed in carefully using available tech and data in combination with machine learning while adhering to the concept of lean production, we hope to be able to help enhance business effect and keep Mittmedia out there for years to come.